Sound familiar? Yeah, that’s how the routine usually goes. And it is a routine for many of us. Our patterns of behavior are so ingrained in us that we rarely pause to reflect; let alone seek an active and positive way towards change. It escalates to a habit, and one that is clearly not working for us (sometimes under the guise of multitasking). So how do we achieve excellence? One way is through reading, studying, and then applying the great wisdom that can be gleaned from the ever-famed self-improvement books that we all know and love. Yeah, I say that tongue-in-cheek a little bit, because, let’s face it, many of us don’t want to be seen in that section of the bookstore. But let’s be honest for a moment: bombastic claims and marketing tactics aside, there is much we can benefit from in that section of the bookstore. Believe me, I wasn’t always a “believer,” but once I started reading a number of these books, it really started to click. And my life started to change, and still is. It’s not all cheese and fluff my friends (but you do have to choose wisely, admittedly). One such wise choice is Brian Tracy’s Eat That Frog!. It’s a short read, just under 120 pages in all. But it’s an impactful read. The 21 ways that he shares are real game-changers, if you read with an eye towards improvement and an intention to make a change. I have benefited greatly from this book, and I highly recommend that you pick up your own copy today. 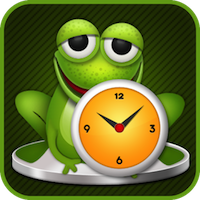 It all starts with the basic premise that your “frog” is your “biggest, most important task, the one you are most likely to procrastinate on if you don’t do something about it.” And what if you have two frogs? Eat the ugliest one first, he says. You see, if you tackle the most unappealing task first, everything from then out out is easier. Once that major thing is out of the way, you will gain momentum and will find greater ease in the other tasks that you have to complete. Just be careful not to celebrate too much after “eating” your biggest and ugliest “frog” though, it could just cause you to slack off on the other tasks! It really is about balance. The key to reaching high levels of performance and productivity is to develop the lifelong habit of tackling your major task first thing each morning. 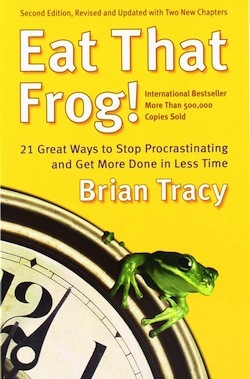 ~ Brian Tracy, Eat That Frog! And the book just cascades on from there: set the table, plan every day in advance, practice creative procrastination (this part was interesting! ), leverage your special talents (and we all have them), maximize your personal power (sounds like some classic Tony Robbins there), get out of the technological time sinks (iPhone addicts out there!, ummm, me), and much more. He really does cover all the major bases. So let me close with a question for you all.. What is procrastination really about, and what do you do to overcome it? Share your thoughts about that, and about this post, in the comments below. Let’s chat! Christopher J. Moore is an internationally renowned educator, public speaker, author, and entrepreneur. He is the Founder & CEO of Moore Creative Ideas, the publishing platform for Reflect On This, and many other sites to come. Chris first started Reflect On This in 2005 as a way to express his personal reflections on life and living. After completely revamping the site, it has now grown to what you see today.